Among the hundreds of submissions for a German national memorial to the murdered jews ot Europe, Horst Hoheisel’s design embodied very precisely the impossible questions at the heart of Germany’s memorial process. 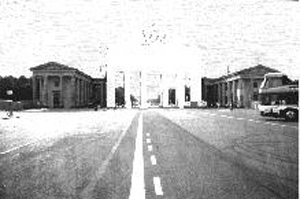 Already well-known for this negative form monument and his Denk-Stein-Sammlung in Kassel, Hoheisel proposed a simple, if provocative anti-solution to the 1995 memorial competition: blow up the Brandenburger Tor, grind its stone into dust, sprinkle the remains over its former site, then cover the entire memorial area with granite plates. How better to remember a destroyed people than by a destroyed monument? Rather than commemorating the destruction of a people with yet another constructed edifice Hoheisel would mark destruction with destruction. Rather than filling in the void left by a murdered people with a positive from, the artist would carve out an empty space in Berlin by which to recall a now absent people. Rather than concretizing and thereby displacing the memory of Europe’s murdered Jews, the artist would open a place in the landscape to be filled with the memory of those who come to remember Europe’s murdered Jews. A landmark celebrating Prussian might and crowned by a chariot-borne Quadriga, with the Roman goddess of peace, would be destroyed to make room for the memory of Jewish victims of German might and peacelessness. In fact, perhaps no single emblem better represents the conflicted, self-abnegating motives for memory in Germany today than the vanishing monument. Of course, such a memorial undoing will never be sanctioned by the German govemment, and this too is part of the artist’s point. 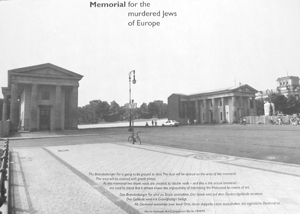 Hoheisel’s proposed destruction of the Brandenburger Tor simultaneously participates in the competition for a national Holocaust memorial, even as its radicalism precludes the possibility of its execution. At least part of its polemic is directed against actually building any winning design, against ever finishing the monument at all. Here Hoheisel seems to suggest that surest engagement with Holocaust memory in Germany may actually lie in its perpetual irresolution, that only an unfinished memorial process can guarantee the life of memory. Better a thousand years of Holocaust memorial competitions in Germany than any single »final solution« to Germany’s memorial problem. 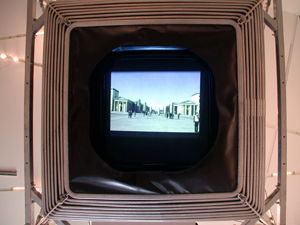 Horst Hoheisel participated in the artistic competition in 1994 for the Memorial For The Murdered Jews Of Europe: he suggested grinding the Brandenburg Gate into dust and dispersing it on the area earmarked for the memorial. The emptiness would represent the inner nature of the memorial: to bear the emptiness of the place without the Brandenburg Gate as a symbol of broken German identity through the Holocaust and to bear the emptiness of the memorial place as a sign for the impossibility of finding artistic means for the remembrance of the Holocaust.